I tried a different technique for layering chalk finish paint on furniture and I really like the result. 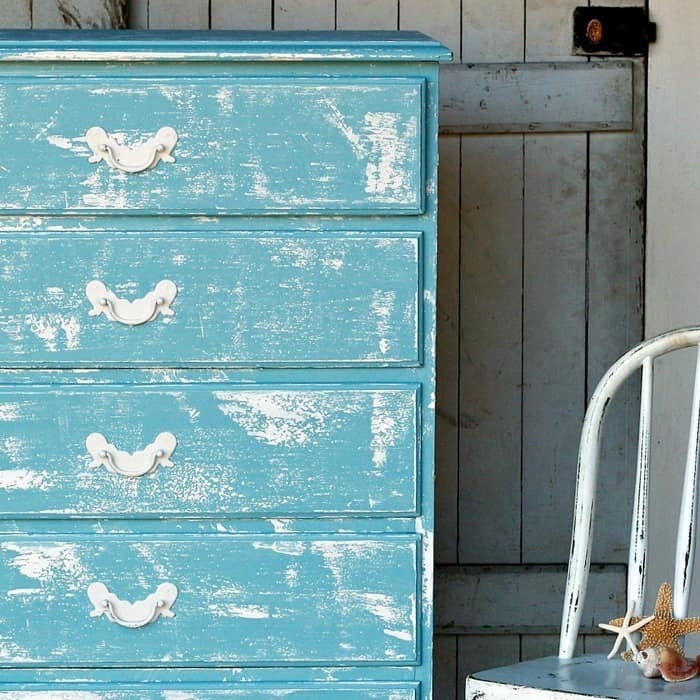 The look is coastal or beachy and might be too over the top for your taste. Just let me know in a kind and tactful way! This is the green chest you guys wanted me to paint and I did. See, I do read your comments and I take your suggestions and ideas to heart. 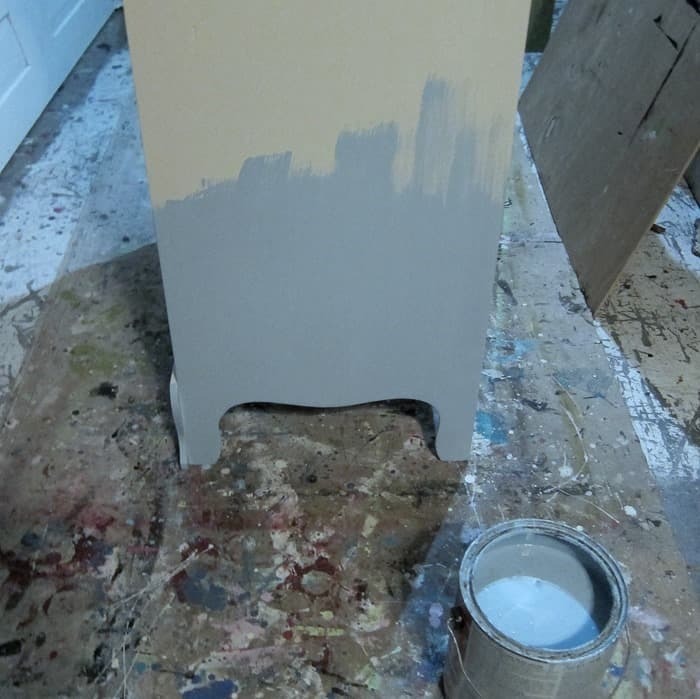 I started with a plan for the chest then changed it twice…..after the painting was done. I’ll tell you all about it. I have a video too showing how I scraped the paint onto the chest and also how I spray painted the hardware. In case you missed the green chest when I wrote about it before, here it is. I found it at my favorite junk shop. 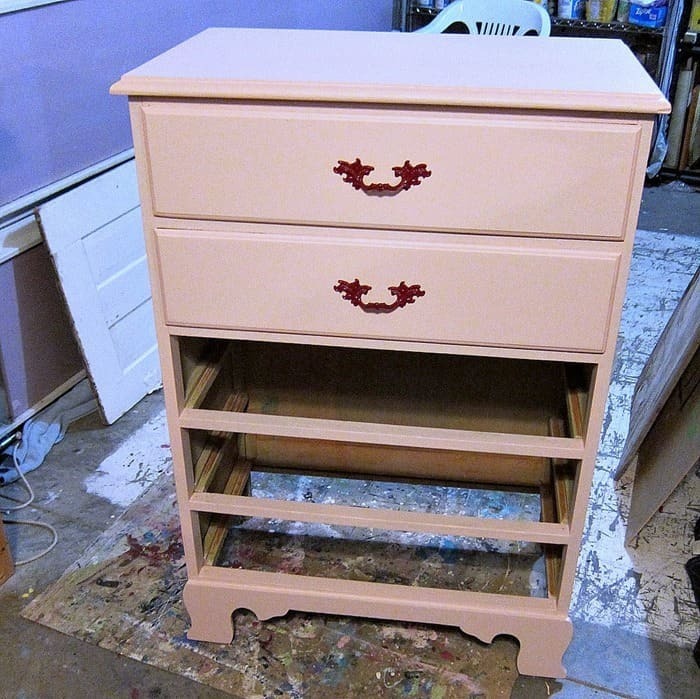 My first vision was to paint the chest a soft pink and change the hardware to French Provincial, spray painted red. Well, I didn’t like that look at all. 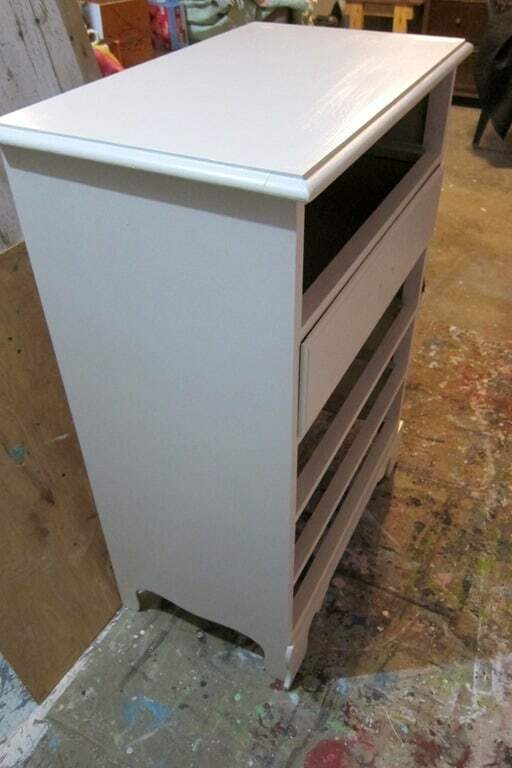 I even tried adding red paint to the edges and front of the drawers using a layering block. Still NO. Next I decided to paint the chest an off-white. Not liking that either. I don’t know why I’m so wishy-washy about my projects lately. Moving on. I went to my paint shelf for inspiration. The can of flat blue paint I found had a coastal feel to it. Might be just the color I need. I painted Sofi’s Little Tykes playhouse with this paint color and itt turned out sooooo cute. I bet you didn’t know you can paint those plastic playhouses. You can see it here. I love a flat paint finish for furniture. So I gave the blue paint a try. It only took one coat to cover the white. I forgot to mention that the blue paint is a can of oops paint I bought several years ago. Can’t pass up oops paint in a pretty color like this. I found these FolkArt Scrapers in my stash of “things I might use one day”. The scrapers are made for distressing paint. I thought I .would use them kind of like a trowel to layer the white paint. 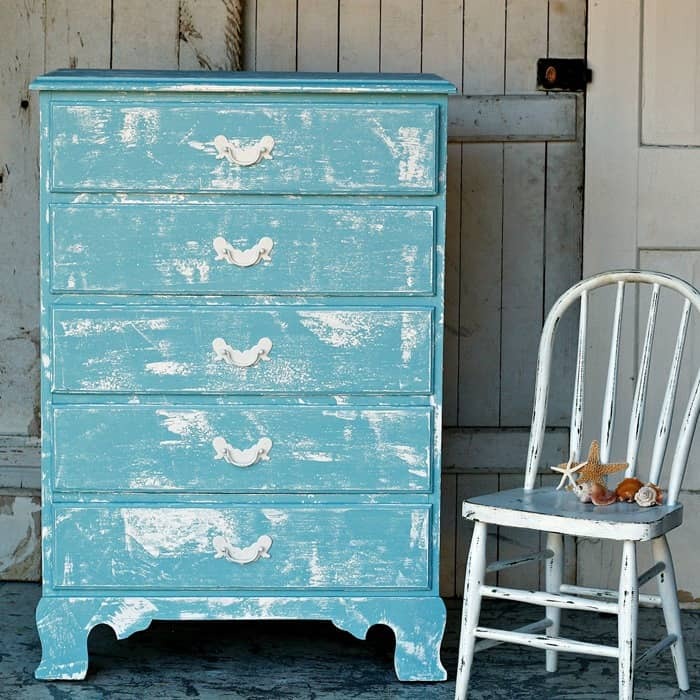 The paint is FolkArt Home Décor Chalk Finish in White. 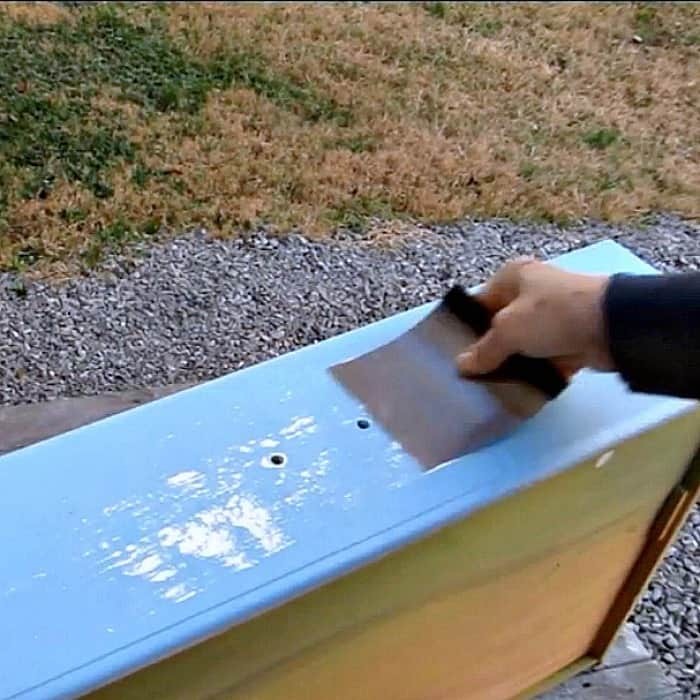 I used a paint brush to apply the paint to one side of the scraper and then scraped the paint across the drawer front….and all over the chest. The video shows the complete process. I really like the scraper as a layering tool. It gives a unique look to the layer of white paint. Not like distressed paint. I used a Rustoleum spray paint primer in white to paint the original drawer pulls because that is the only flat white spray paint I had on hand. The white chair is one I painted for Sofi a few years ago. The seashells are beach finds. The starfish I purchased on eBay because I can’t find them on the beach. 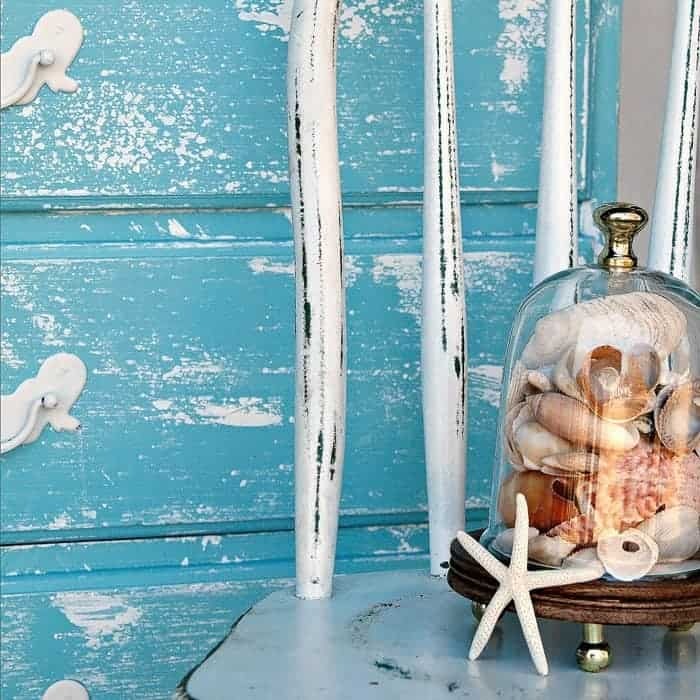 I order them to use in craft projects like these…..Starfish and Sisal Rope Tree……..White and Glass Seashell Container……… and this Simple Painted Terra Cotta Pot. 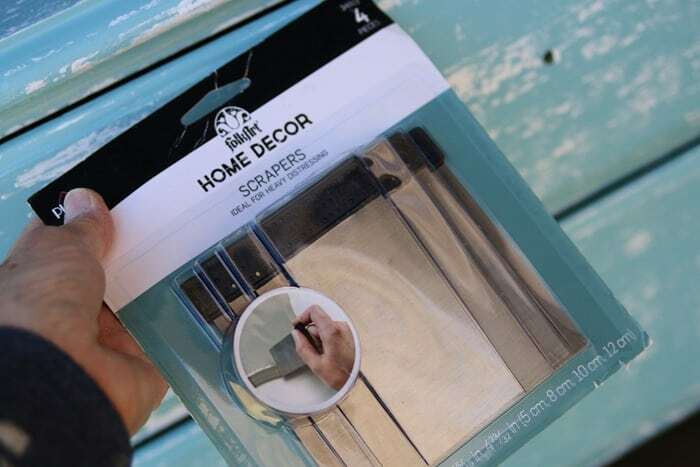 You can see the short video below of me using the scraper to layer the chalk finish and also see how I spray painted the hardware. Spray painting hardware is a 5 minute job at best. 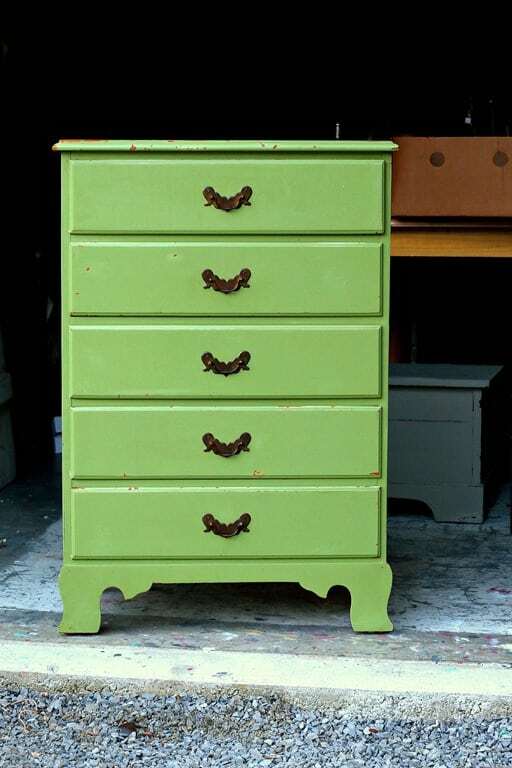 I think the chest of drawers would be pretty in a nursery, boy or girl. The moral of this story…….don’t feel bad if your first plan doesn’t work out. It happens to all of us. And in this case, it’s only paint, easily changed. I love the look and the scraping technique. I’m going to have to try it myself. Thanks for sharing your talents with all of us. Enjoy your site!!! I love the blue and white. Didn’t care for the other colors you tried. Keep up the good work!!!! The splotchy look is not my thing. There’s distress and there’s experiment gone wrong! But what do i know, someone out there might love it. Golly-gee, I just don’t know! I do like the blue color. Not sure about the white scrapings. Looking back at the green you first used I think the blue is more to my liking, but the white scrapes I would have to get used to. I like the white with the blue, but I think I would have preferred a more traditional or recognizable design. I do very much like the white on the pulls, though. So, there it is, my honest opinion! And, of course, the operative word here is “opinion”! I hope you do another project using this paint method as I might decide I do like it if I saw more of it. Does that make sense?? Anyway, I do like your willingness to experiment and try new things to show to us. 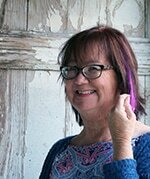 It’s a good way to inspire the rest of us to be daring and try different things, too! Love this look. You can’t beat a beach look. 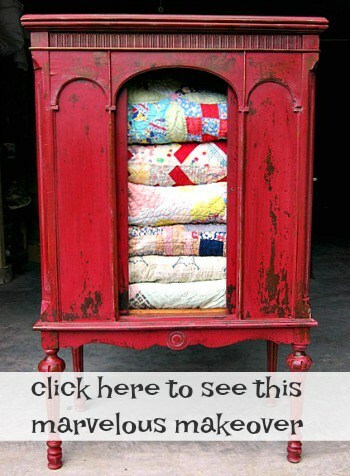 I like the colors that were used, but I prefer when it looks naturally worn on the edges and handles. This is too much for me. It’s always good to see a new technique, though. Thanks! As usual you are the bomb when it comes to re-furbishimg! Love it!! I want to try this. At first glance I thought the handles were mermaids! The color is nice, but… I personally am over the weathered look. 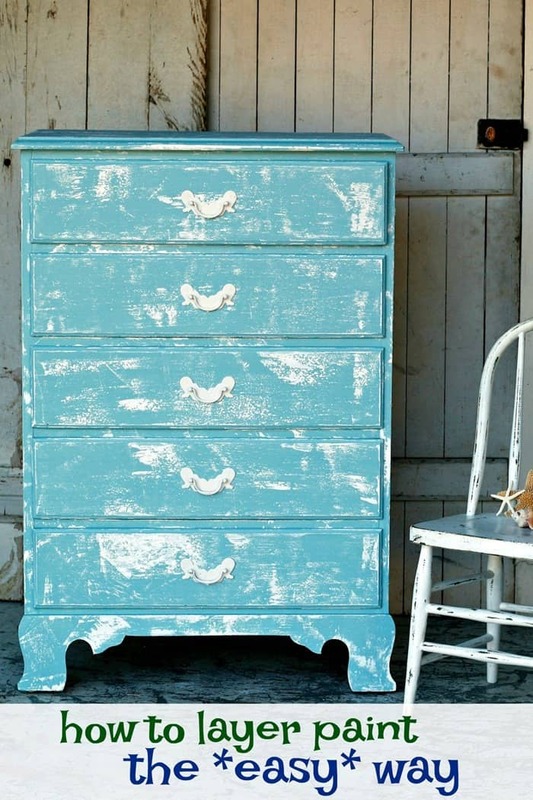 I love painted furniture but I am ready for crisp and clean. 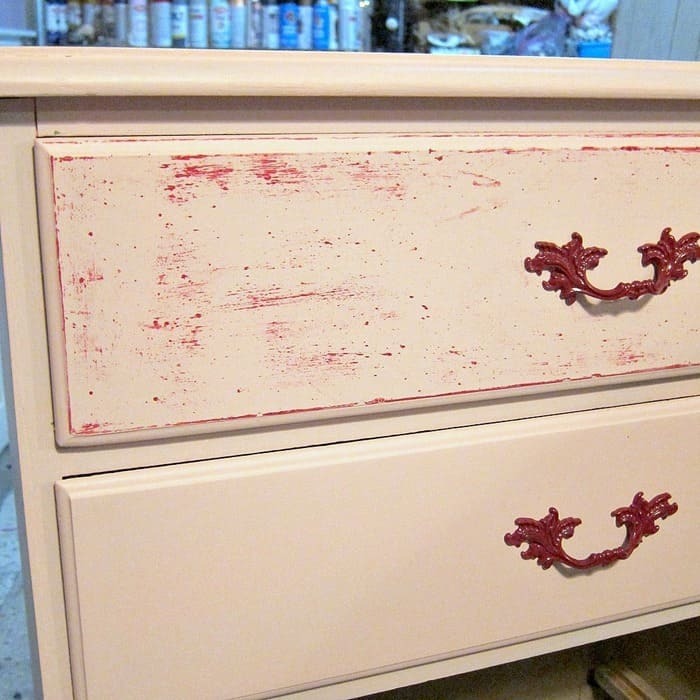 I will be honest and tell you I wasn’t to sure about this dresser at first but it grew on me as i watched how the whit paint was applied. Now I LOVE it!! Think I will have to get some scapprs for myself. Thanks for showing us that cool technique. I’m always open to new ideas but I’m really not feeling this one . I think I would have left it off white and bought new hardware . Not loving that frilly hardware . Looks like a solid chest worth saving . I applaud your creativity and risk taking . But it’s just not my personal taste .